A traditional woodsman tends spit-roasted fresh fowl over an open fire. The morning’s harvest made for a fine noon meal at a meager camp overlooking the River Raisin. Old Northwest Territory, 1792. 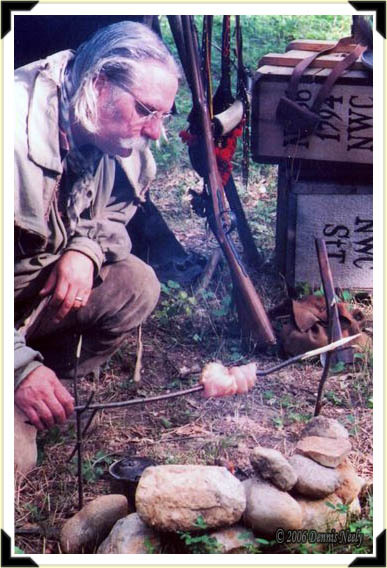 This entry was posted in Snapshot Saturday and tagged Black powder hunting, Dennis Neely, historical trekking, Mountain Man, North West trade gun, Northwest trade gun, trade gun, traditional black powder, traditional black powder hunting, traditional blackpowder, traditional blackpowder hunting, Traditional camping, Traditional Woodsman. Bookmark the permalink.